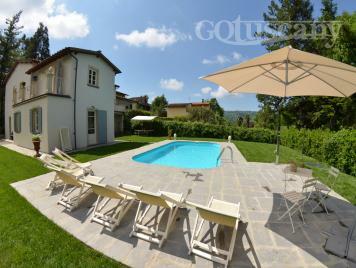 This dream villa is located in Pieve di Camaiore, on a hill, on a sunny spot. The villa disposes of a wonderful and well kept garden with fountains, old trees and an electrical entrance gate. The garden is partially fenced. Villa Botticelli is an excellent choice: you have the advantage to rent the property set amidst greenery where you may relax under the Tuscan sun or stroll in the surroundings and nevertheless, the sea with its endless long sandy beaches is not far away, Lucca and all art cities of Tuscany such as Pisa, Florence or Siena are within an easy reach. It is also pleasant that you have the possibility to do your groceries on foot or to go for dinner to the nearby restaurant. The external area equipped with tables, chairs and barbeque invites guests to enjoy the outdoors to the full - dine outside and live the Italian lifestyle. Refresh yourselves, during the hot hours of the day, in the swimming pool, set in earth (8,50 x 4m, deep: 1.40m) equipped with deckchairs and sun umbrellas. Entrance on the ground floor: spacious living-dining room with exits onto the garden, living room with two couches, SAT-TV, fire-place, dining table. Kitchen with dining table, stove, electrical oven, big American styled refrigerator and freezer with ice dispenser, washing machine, filter coffee machine, microwave, toaster, exit onto the garden. 1 bathroom with WC, basin, bidet. 1 utility room with washing machine, sink. Stairway to the 1st floor: 3 double bedrooms each with exit onto a balcony and each with en-suite bathroom with shower, wc, bidet, 1 twin bedroom with en-suite bathroom with spacious shower, wc, bidet, 1 master bedroom with exit onto two balconies and en-suite bathroom with tub, bidet, wc. The owners restored the villa with great care and did not spare expenses. The property is tastefully furnished – all your desires will be fulfilled. Terracotta tiled floors, the furnishings, accessories, curtains and the paintings of the walls are in perfect harmony. Free internet! Parking within the grounds. Villa / luxury houses 300 sqm.